As I’ve gotten older, I’ve become more and more loathe to go to heavily tourist spots as my patience for such scenarios has grown quite thin. Still, I will occasionally break this rule for sites that are so integral to the city I’m visiting, they really can’t be ignored. 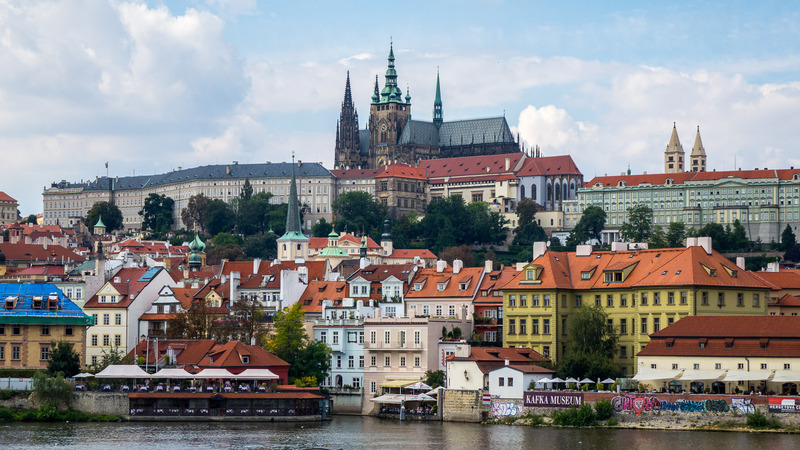 Prague Castle certainly qualified for this. But first, Chris and I needed food so we made a quick walk around the corner to a place i had spotted the previous night when returning from dinner. The restaurant, Putica, was relatively empty and we soon found out that for lunch they had a very limited menu – as in 2 things. The waitress though insisted that the trout was excellent and so we both opted for that despite the fact due to her lack of English, we had no idea what else it came with nor how it was prepared. It turned out we shouldn’t have worried as it was delicious. 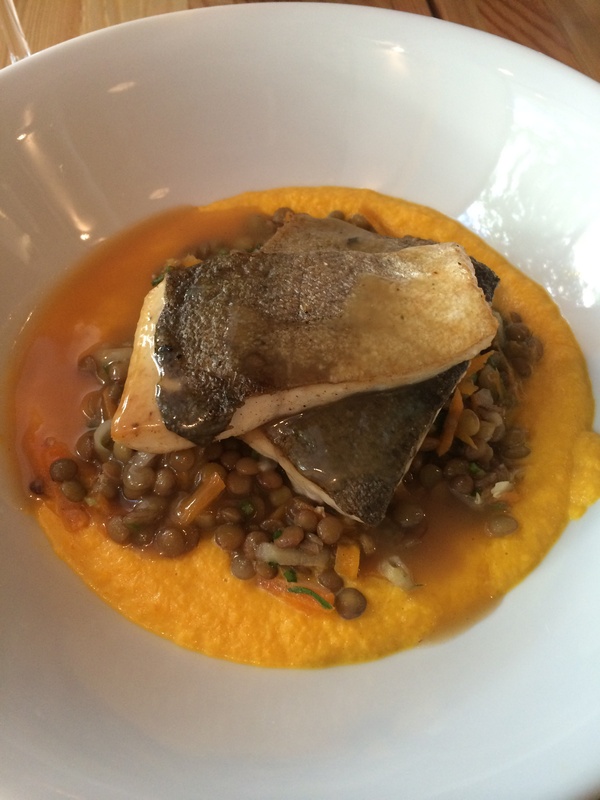 The trout was perfectly cooked and the lentils with a carrot ginger puree gave the dish a lot of complexity. Not bad for $5 USD! We finished up and continued up the street to the 22 tram, which we had taken home the previous day so we knew the drill. 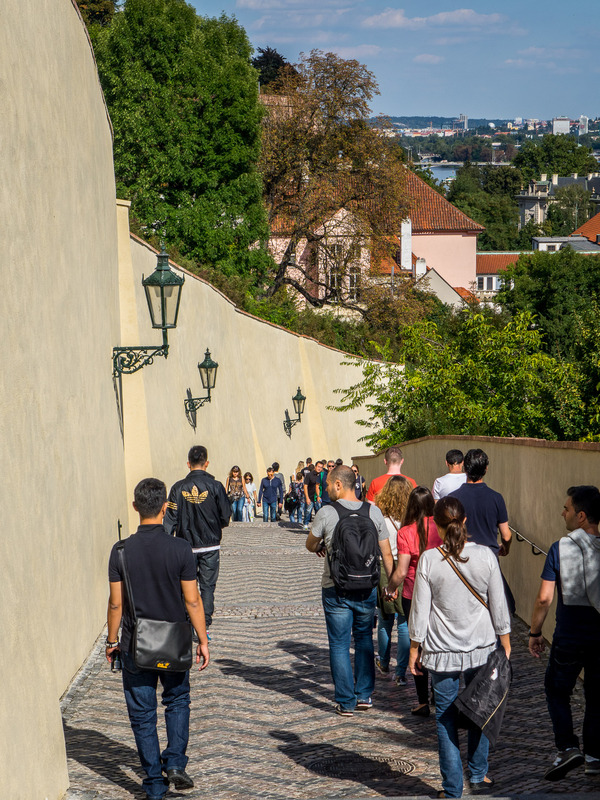 This line goes all the way up to Prague Castle and just under 30 minutes later, we had climbed up the steep streets to upper entrance of the grounds. 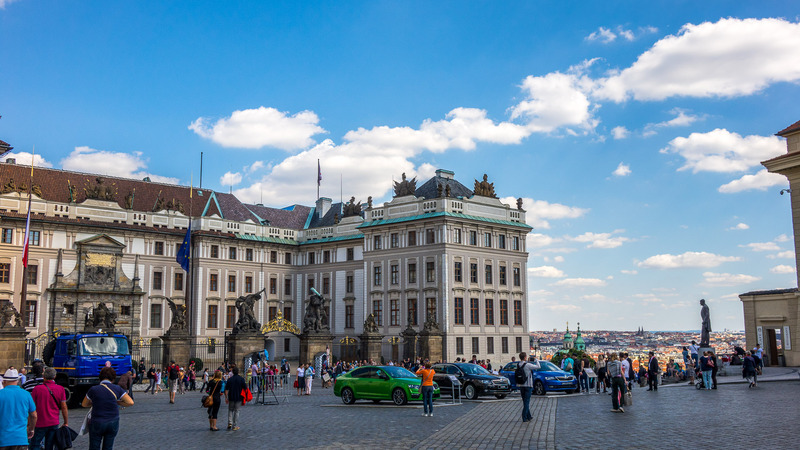 I had read there was a better route to get to the main portions of Prague Castle by taking a backroad and after a couple of failed attempts, we found it, with as had been promised, almost no one around. This bliss was short-lived though when we approached the main entrance to the castle. Here it was tourist central, with large groups being led in various languages, people snapping photos everywhere and even a Chinese torture protest as there was apparently some sort of summit going on there. Still, it was all pretty breathtaking. 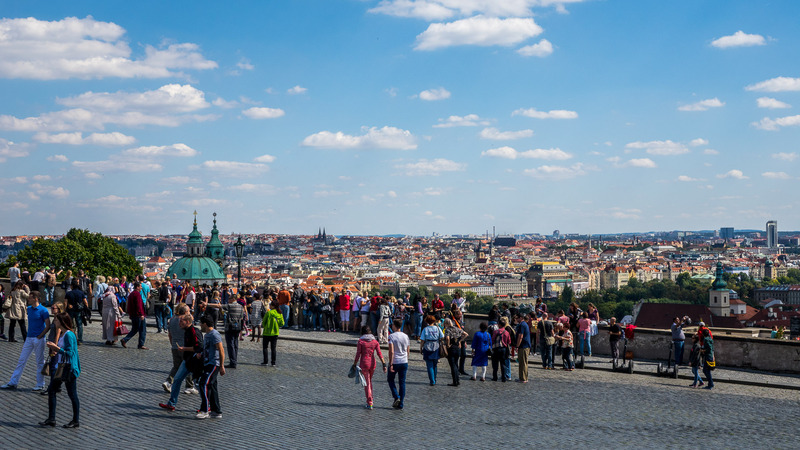 Perched high on the hill overlooking both the old and new parts of Prague, the castle was a Gothic marvel. Originally started in the late 800s, majority of it was finished in the 1500s so it was no surprise to see such familiar Gothic as flying buttresses and of course many gargoyles. I was particularly impressed how much of it seemed to be intact but given the location, it was definitely not an easy castle to storm for any would-be invaders. Since we weren’t doing a guided tour and given the lack of many plaques or signs indicating what the various buildings were, I purchased a detailed map, which proved to be very handy as it also had a lot of interesting historical information. 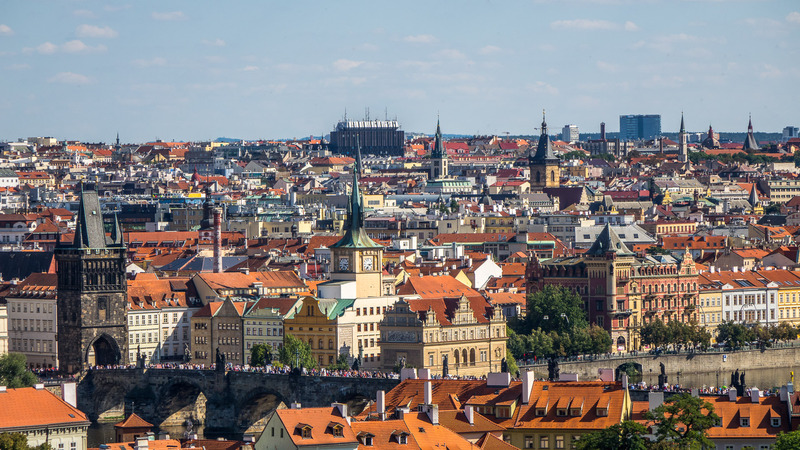 The massive St. Vitus Cathedral was the centerpiece, which dominated the grounds in all of its Gothic glory. There was also a couple of art museums, an arena for classic music concerts and lush gardens which on that day was filled with many newlyweds wanting to get their perfect wedding shot. There was also what both Chris and I agreed had to be the nicest location for a Starbucks ever. The terrace views alone were worth the jacked-up price I paid for a small bottle of water, which was necessary as the direct sun was making it seem a lot warmer than the 72 degree temperature. After a couple of hours of wandering, we made our way down to the Old Town which is at the base of the castle. It was an impressively steep set of stairs, which made me glad we were going down them and not up. To that end, there were many people huffing and puffing their way up, some having to catch their breath after realizing perhaps that wasn’t the best path to take. After a brief respite of some truly delicious pistachio gelato (not pictured as I was too eager to try it before remembering to take a pic), we once again boarded the 22 tram and make the quick trip back to our loft for some rest. 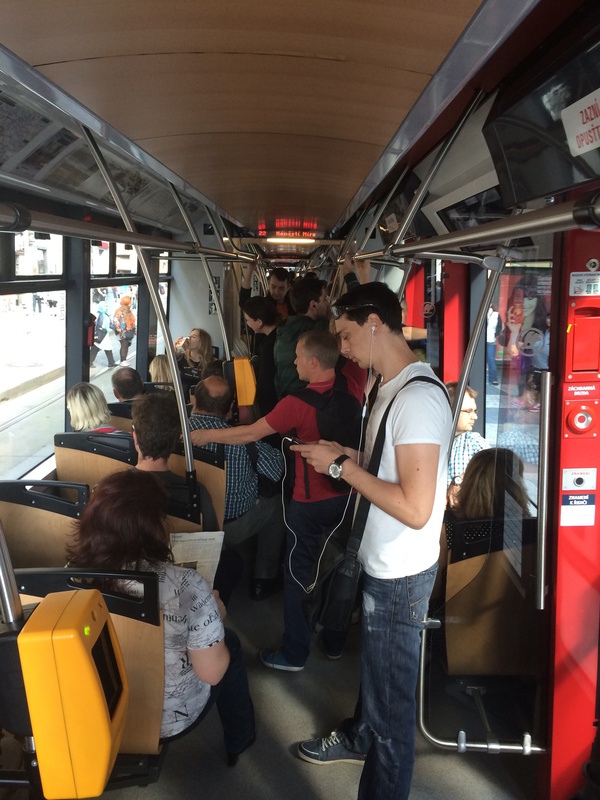 I continue to be impressed how clean and efficient the mass transit system is in Prague. 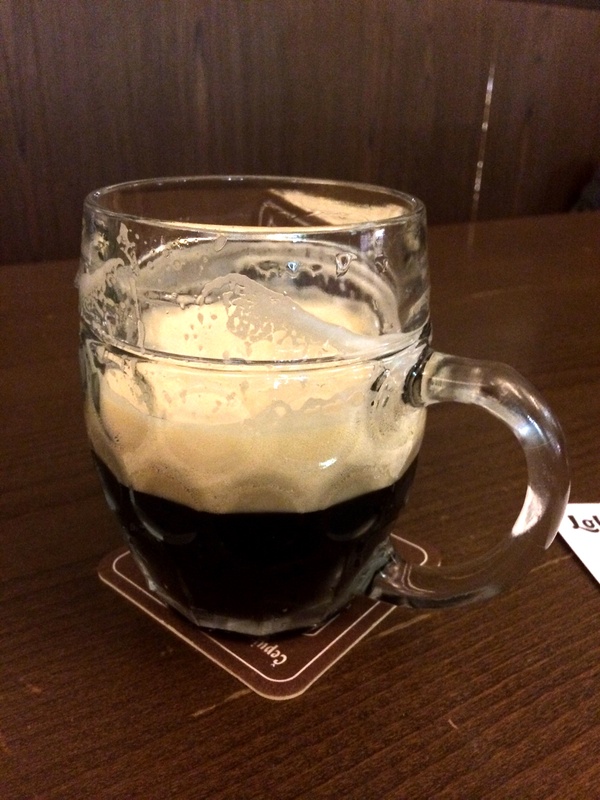 I had made a reservation at a traditional Czech brew pub called Lokal, which was the same group that runs the Nase Maso butcher shop we had been to earlier in the week. This time we decided to walk to see Old Town Square at sunset. The streets were filled with people and the energy level had increased substantially. We arrived at the restaurant right at our reservation slot and were escorted down a huge hall filled with happy Czechs eating, drinking and chatting. Lokal’s philosophy is to take the staples of the Czech communist area but make them modern with fresh ingredients and with better care. It’s also known for a world champion beer server who runs the beer program. 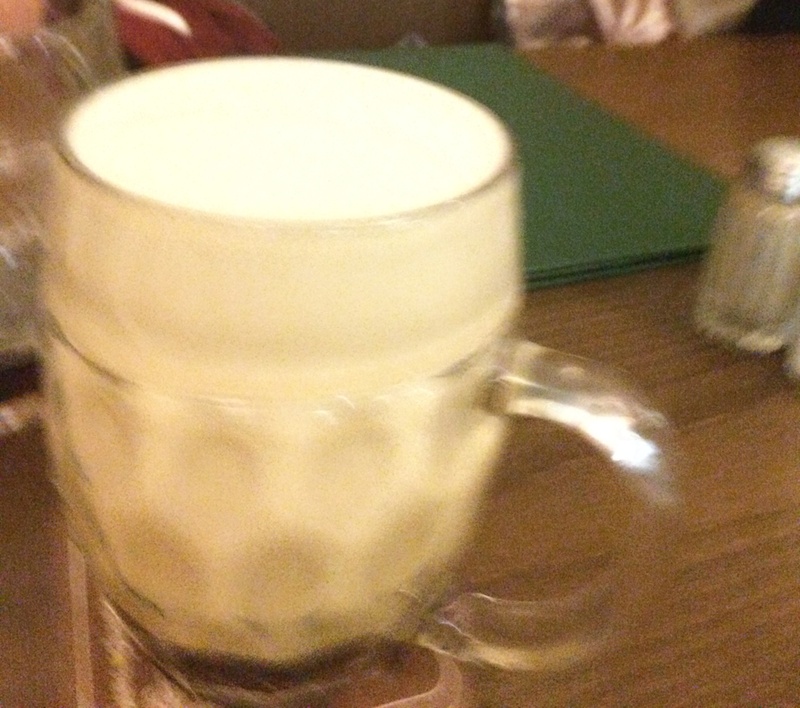 There were only 2 beers from which to choose, Kozel Dark and the ubiquitous Pilsner Urquell. However, there were multiple options on how to have the beer poured. “Slice” meant to have half foam and half liquid. “Creme” was a more blended version of foam to liquid (similar to a Guinness pour) and the most intriguing “Sweet”, which was an all foam pour. I opted for a “slice” pour first as I wasn’t quite ready for all foam. I asked the server which of the main dishes she preferred and she excitedly told me how good the pork neck steak was. I do enjoy pork neck but had only ever had it as a slow cooked braise. The meat had been quick fried to make it more tender and it tasted like a slightly richer pork chop. 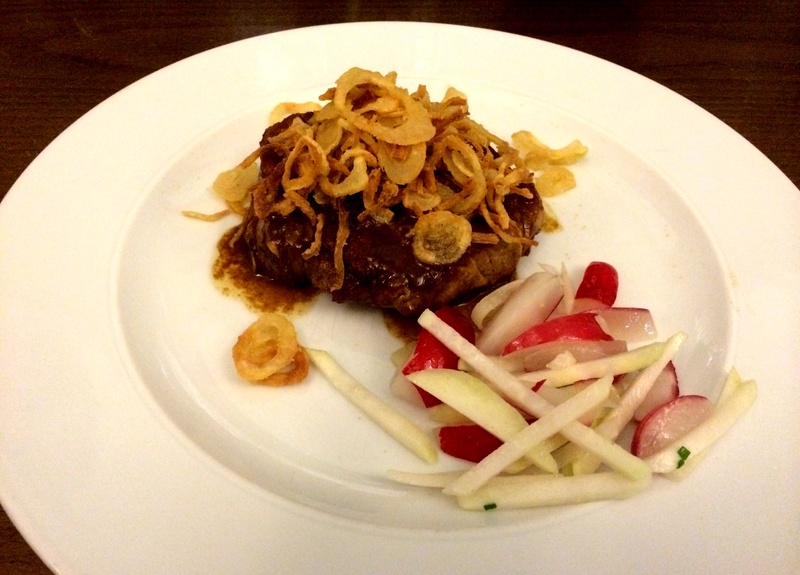 The fried onions on top were a nice touch as were the julienned radishes with just a bit of butter. It was very traditional both in presentation and taste but delicious. I decided to have a “sweet” pour as my dessert and soon this fascinating glass arrived. It turned out that the pure foam didn’t really last that long but it was fun to try for at least a few sips. I added the rest of my regular pour to event things out a bit and really enjoyed the new combination. 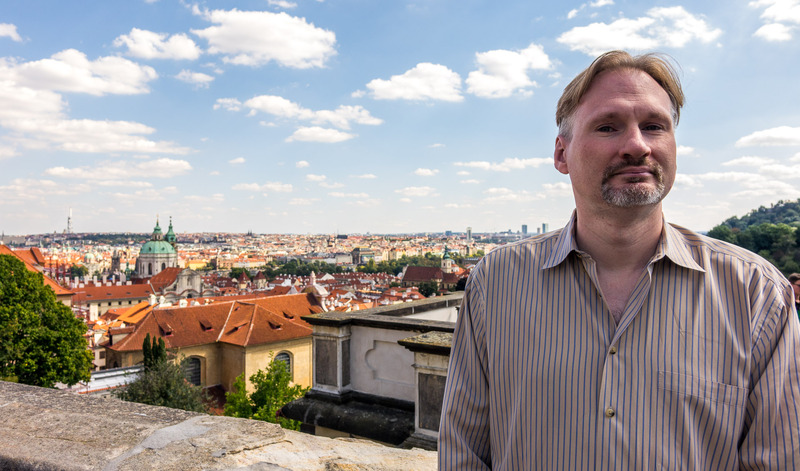 Prior to my departure to Prague, I had gotten in touch with a potential client who lived there to get some tips from him. As luck would have it, he was going to Lokal that night as well and suggested we join him there after our dinner. 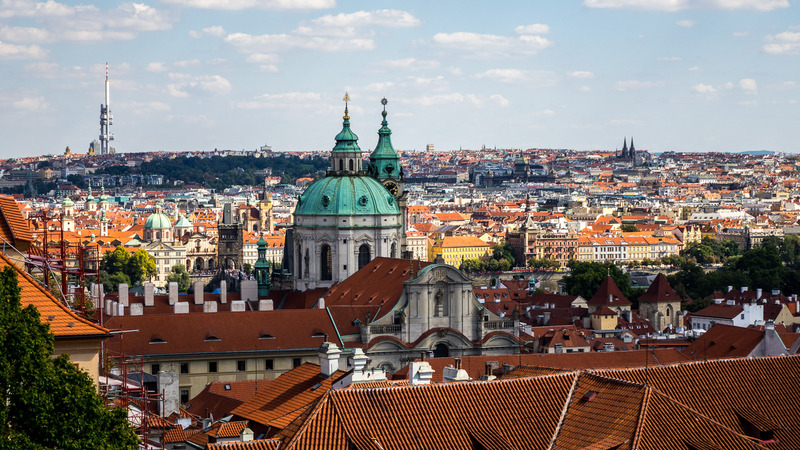 He was there with his girlfriend and an ex pat from New York who had been in Prague for 7 years. We chatted with them for a bit as they finished up their dinner and then proceeded to what he referred to as one of the best bars in the world, Black Angels. 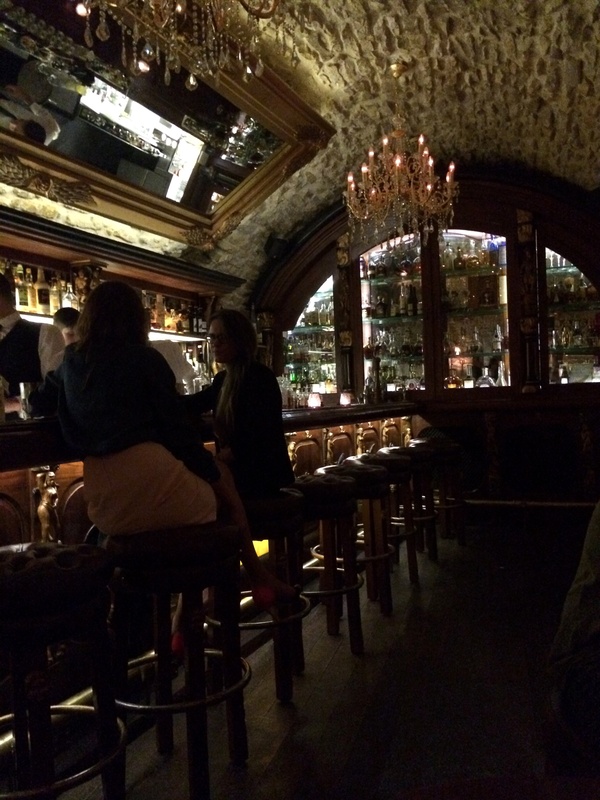 The bar was located in the basement of the small U Prince Hotel and was known for its award-winning drinks. The owner of the hotel apparently didn’t charge the bar any rent so the prices were basically half of what you’d expect in a top flight mixology-based bar. The atmosphere was pure kitsch but done in a winking fashion, which pirate regalia and a piano player who evidently could play anything requested. After I snapped that pic, our host quickly admonished me saying that they had a very strict no photography policy as many celebrities, athletes, and bigwigs like to go there. The drink list was very impressive although only in Czech. Fortunately, all of the drink names were in English as they represented such classics as a Manhattan, Dark & Stormy, Old Fashioned and many more. A round of whiskey sours were ordered but not wanting something that sweet, our server suggested their version of Penicillin. which had won a major award recently. Since it was so unique looking, I asked the server if I could quickly take a pic and she agreed. 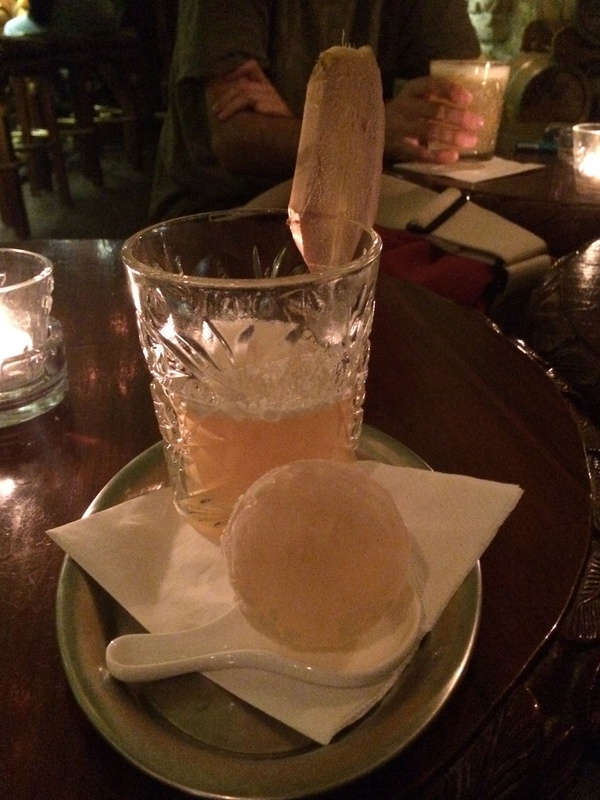 The ice sphere had Lagalluvin Scotch whiskey suspended inside it so as the ice gradually melted, it added a smoky undertone to the drink -very creative and tasty. 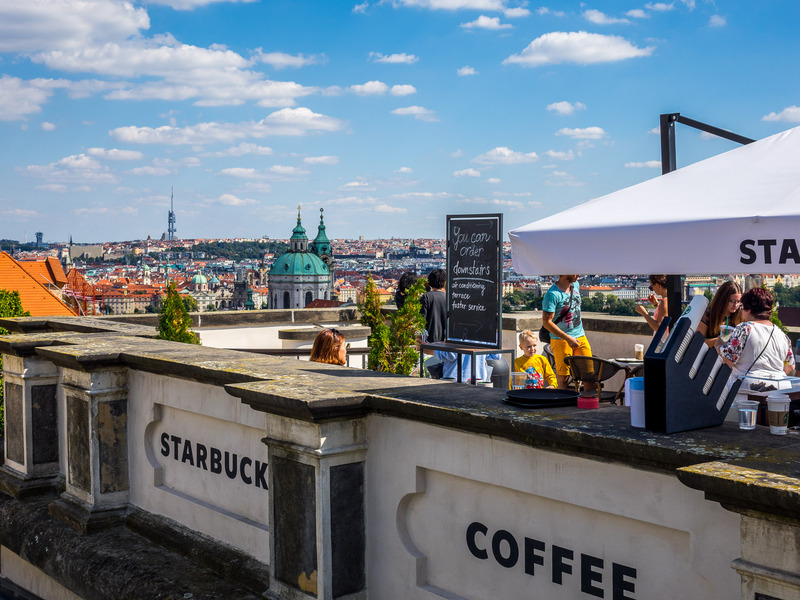 As we enjoyed the cocktails, our host told us the crazy story how a few years ago due to some tainted alcohol that had killed a bunch of people, the Czech Republic had implemented a temporary ban on all alcohol sales. When the owner of the bar protested, he was told he had to find certificates of authentification for each bottle. If a single bottle was proved to be undocumented (and therefore potentially unsafe) the bar would be heavily fined. Since the owner prided himself on only the best of alcohol available, he was able to meet that agreement and became one of the only bars allowed to stay open during the prohibition. With that in mind, I decided for my second drink to have a pure spirit. After sadly finding out that the listed Pappy Van WInkle 20 (for only $15 USD) wasn’t in fact available, I settled on a 21 year Nikka Taketsuru for a mere $11 USD, which is insane. By this point it was almost 1AM, and with Chris fading fast and I knowing another round would be ill advised, we made the trek back up the hill to the loft. Posted on August 30, 2014 by reyalto. Bookmark the permalink.